Firstly, I want to tell everyone that despite tempation I am still going strong with No-Buy October! I haven't purchased a single centimeter of fabric. I almost accidentally bought some on Etsy, though. I convo'd someone and hmmm'd and had my finger on the "buy" button before--WAIT! It's NO-BUY OCTOBER! Whew. Disaster averted. Sorry, Hunky Dory yardage. You can wait until 1 November. 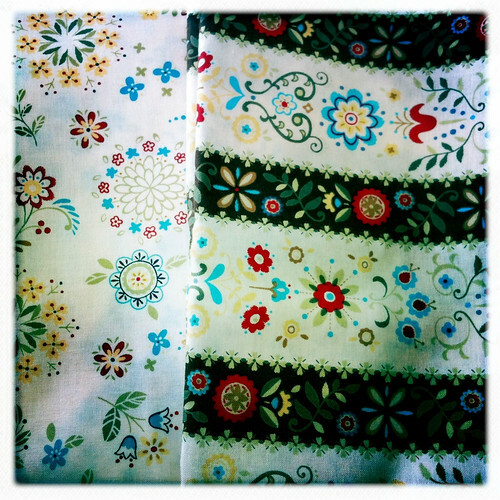 Thirdly, I did get some fabric in the mail this week, hooray! My half-yard Across the Pond set arrived on Thursday and two gorgeous yards of complementary brown-stripe Lecien My Folklore arrived Tuesday. I was a very happy camper. Check out this Lecien; it's the same colorway as my very favorite fabric ever. I'm kind of freaking out. I want to frame it! Anything I sew with it won't be good enough! I love it so much! Exclamation marks!! But I love Across the Pond, too. 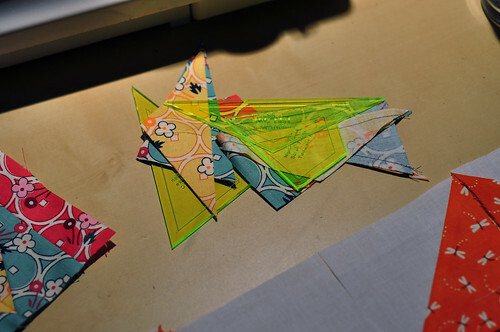 Especially the cranes. Oh, how I love birds. It's so blue and orange. I can't wait to cut into it. 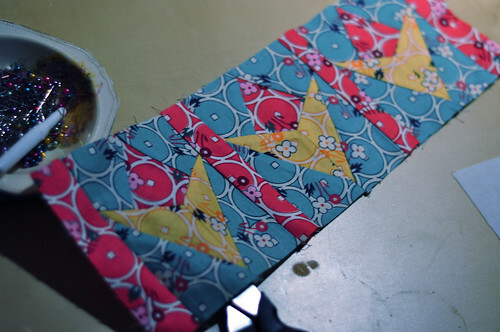 I am thinking a kaleidoscope quilt. 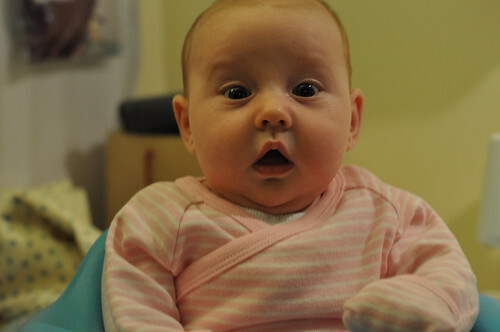 Of course, when my best helper watched me tear into those pretty parcels, her eyes got huge. I know just what she was thinking. "You bought EVEN MORE fabric?" I love that face. Check out her mad sitting-up-in-the-Bumbo skills, too! Her little neck is so super-strong, people stop to stare. I try to explain I'm not a bad mother and I'm not letting her head loll everywhere, she actually LIKES to be craned backwards like a gymnast. If I try to snuggle her head close, she shrieks and does this little cough-cry-hiccup thing. Which is way worse than My Baby, The Human Rainbow. So we love the Bumbo. Crane away, kid! I'll just be sewing with my pretty new fabric. Next week I should be getting the last of my mail-ordered fabric (a Sophie fat quarter set) and then the real drought begins. I'm just hoping for time to sew this upcoming week! It's been a hectic weekend and I'm only just now sitting down enjoying some free time. 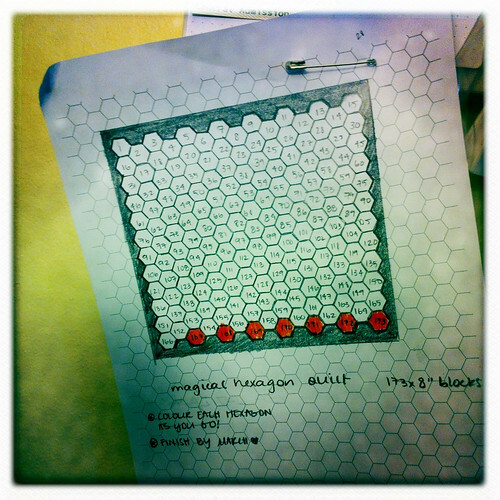 Time to get out my handwork and sew another hex square... seven down, 166 to go... yikes! 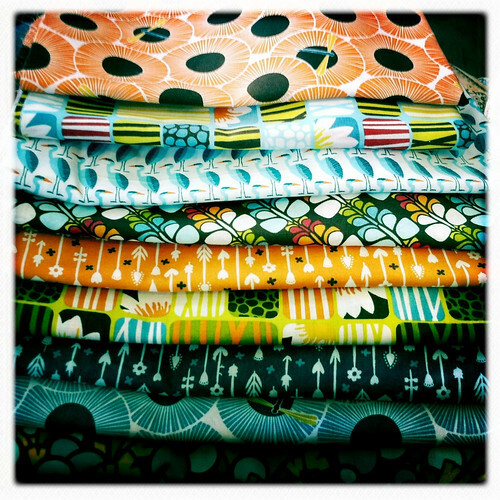 I don't usually get the chance to do big build-ups when it comes to fabric shopping, no matter how much I'd like to. Being a miserly new momma means I need to count my pennies and parcel them out very carefully...so I usually shop for a project, or for inspiration. So I spend a lot of time staring wistfully at the beautiful bolts on the shelves of my favorite stores, and more time wishing I were independently wealthy! But this week, the Tax Return Fairy waved her magic wand and after a big, doe-eyed discussion with Mr Poppleton, I had leave to splurge! It was heavenly to walk into Material Obsession on Friday and boldly say "I'm here to shop for my stash!" 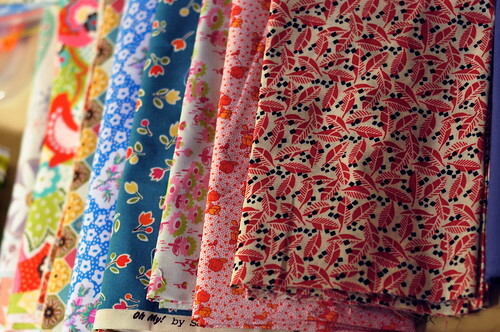 I got a few good fat quarters, some Lecien, some Sanae for Moda, and some 1930s fabric for my quilt for Rachie. 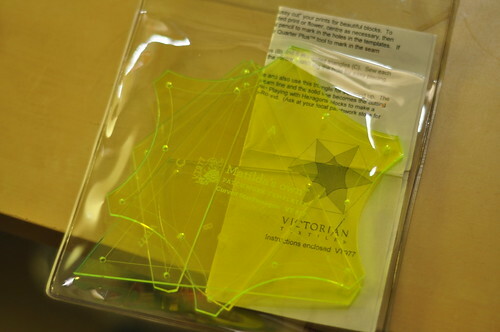 I also got a new kite-shaped template and a free pattern to go with! 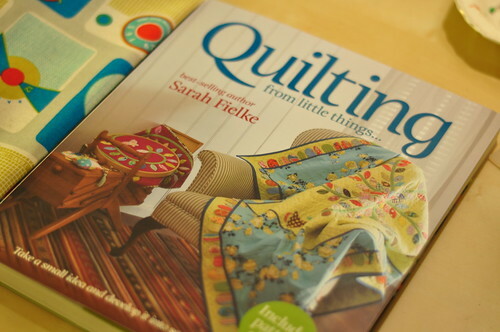 Last but DEFINITELY not least is the latest addition to my quilting bookshelf. I've been a huge fan of the Material Obsession books so I've had my squidgy little eyeballs on Sarah Fielke's new book for weeks. I finally procured a copy and I was so stoked! 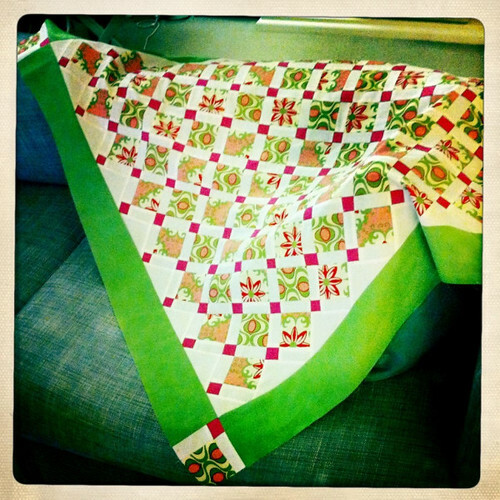 So many gorgeous new quilts and even more inspiration! Look at it...it's so beautiful! You can find your copy at your local quilt shop, or here. 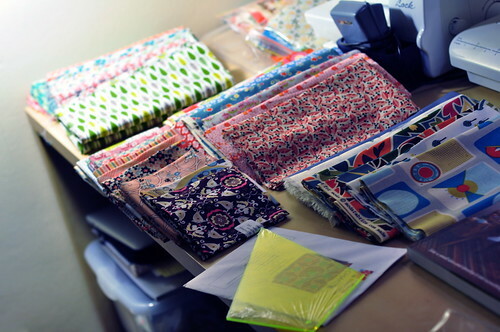 I'm a very happy camper, with miles of new fabric to play with and dozens of ideas cropping up. 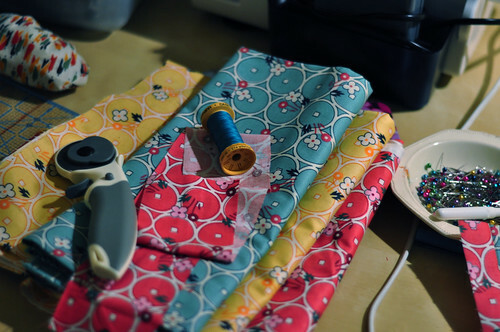 I've already started on the curved hexagon template with some treasured scraps of bright blue fabric, and it has inspired me to finish up the projects I started...so I can get new ones underway! Hooray, new fabric! I have been very slack with my crafting this week, not because I am not dying to sew, but because my 6-week-old has decided to fulfill her obligation as a growing child and, well, grow. At an alarming rate. One morning her jim-jams simply did not fit. Combined with the fussiness, sudden breast refusal, and super-clinginess, and not much sewing or writing was done. Or blogging. Urgh. I took a much-needed break today and disappeared to the fabric store for half an hour, and picked up some pretty purples for a quilt idea I'm playing with. 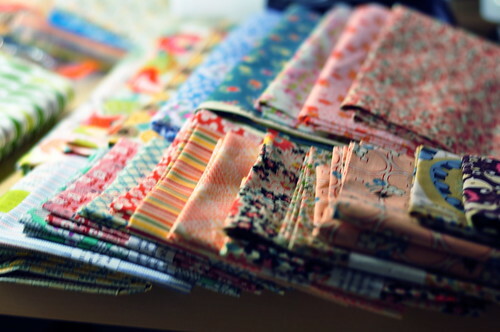 I generally buy my fabric first, let it simmer for a while on my desk or shelf (where I can see it), then see a pattern in a book, or online, and it clicks. I might not have the time to do that for this quilt, so I will give myself the weekend and start cutting by Monday. (I hope.) 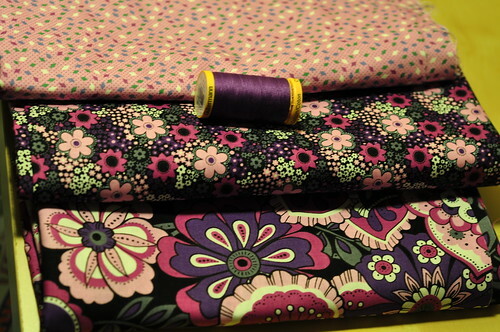 But the fabrics are quite pretty purple florals, so I hope I can put them to good use! One thing I did get to do this week that I'd been planning for a long time was reorganizing my bookshelves. See, we Poppletons are readers. We have somewhere in the neighborhood of 900 books and for a long time, we had them haphazardly double-stacked, arranged willy-nilly, with pictures and receipts and pencil cups all mixed in. 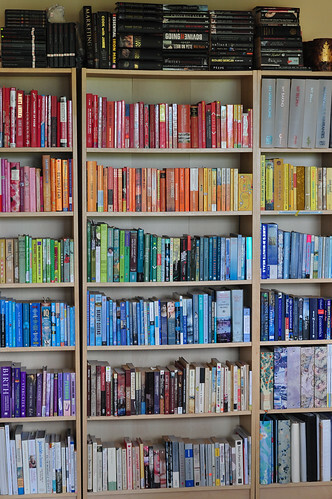 I got sick of it looking messy so I pulled everything off the shelves and organized them by color! 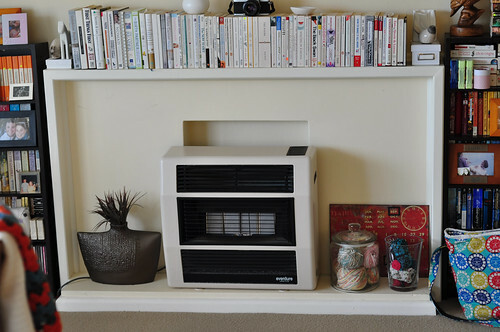 Then I faced and fronted the books and found homes for the black and the white books (they were "extra"). It looks pretty great, if I do say so myself! Combine to make a pretty string of Night Garden blocks! They are quite matchy-matchy so I think they'll be quilted in stripes, with alternating colors and styles to balance it out. But I do so love that block! It was a lucky leap of faith that led me to pick that template pack up last Saturday. This will be really fun to finish. I can't wait to send it to my niece! She is going to love it! It is almost 10pm which means...I'd better get a few blocks at least cut out before my eyelids slide closed of their own accord!